Eliminate common allergy triggers altogether with Natural Balance L.I.D. 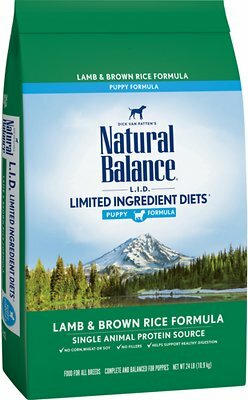 Limited Ingredient Diets Lamb & Brown Rice Formula. This delicious dry dog food is designed specifically for puppies with DHA from salmon oil to help support neural development and custom shaped kibble for smaller jaws. 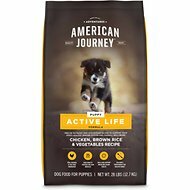 It’s made with lamb, which provides a premium quality protein source, along with brown rice and rice bran as healthy carbohydrate sources to help puppies with stomach sensitivities. Crafted with limited carbohydrates and no artificial flavors or colors. I had been feeding my 13 year old poodle Fromm for 7 years and no problems ever with her stool. Then we got a goldendoodle and around 4 months old he started to have diarrhea every time. The service dog trainer our breeder used recommended this brand when dogs have sensitive stomachs. The same day getting fed this food, my doodle has had firm stool ever since. Going on a year now. And come to find out he can’t eat processed chicken or beef. So I mix this food up by putting lamb wet on it or duck or salmon toppers from Stella and Chewy. My puppy has had tummy issues and was previously on Science Diet i/d. Natural Balance LID was recommended because of her allergies to wheat, oats and barley. Chloe has had no issues since transitioning to this food which makes us both happy. She likes the taste and I love that it has limited ingredients. Finally no more prescription food! Yes I love chewy and my dog Snow do too. Her dog food I ordered Snow love it. I will be ordering from chewy whenever I need something for my dog Snow. I thank you and Snow do too. We adopted our little rescue pup at 8 weeks old. She certainly loves this food. It was recommended by her rescue center. My puppy is allergic to chicken and it has been difficult finding a food he likes without chicken. He seems to like this puppy food but will not eat it dry. Chewy delivered as promised in 1-2 days. I've started the auto-shipments with this puppy food. Looking forward to no more logging heavy dog food bags. 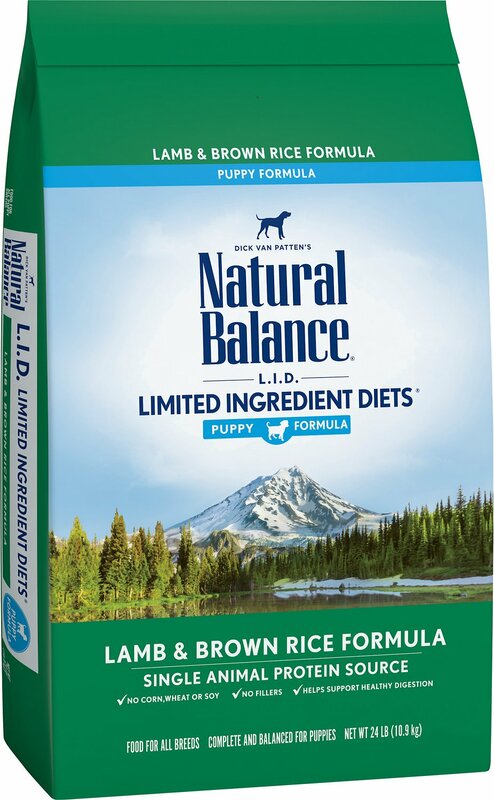 Natural Balance must’ve changed their formula on this as they did my cat’s food. Used to be great for my dog’s loose stools, but the new bag brought back the old problem. Gotta switch brands again. Switched to this to see if the limited ingredient diet would help with her dry skin. Haven't been feeding it long enough to see a difference but the small size of the individual kibbles makes this a real winner for training. Can mark and reinforce many more behaviors for fewer calories. That's a winner in my book! Have a puppy who doesn’t care to eat until we found this food. Now she is begging constantly for more.